Geopolitical strategy in the changing Asia Pacific region. Social Media, Human Rights, and Democratization in the new millennia. How Do Malang’s Instagram Influencers Use Their Freedom of Expression and Speech? 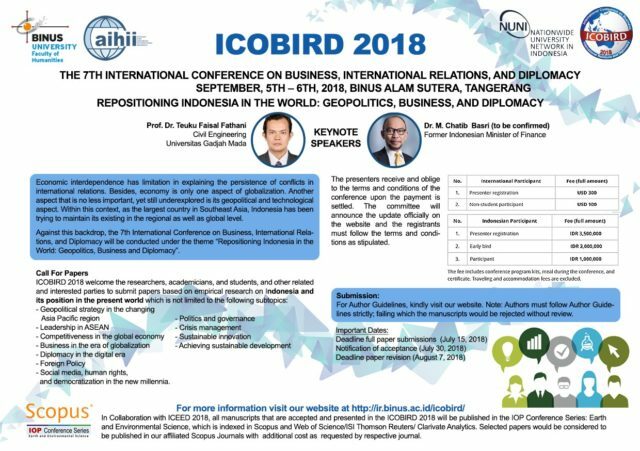 In Collaboration with ICEED 2018, all manuscripts that are accepted and presented in the ICOBIRD 2018 will be published in the IOP Conference Series: Earth and Environmental Science, which is indexed in Scopus and Web of Science/ISI Thomson Reuters/ Clarivate Analytics. Selected papers would be considered to be published in our affiliated Scopus Journals with additional cost as requested by respective journal.